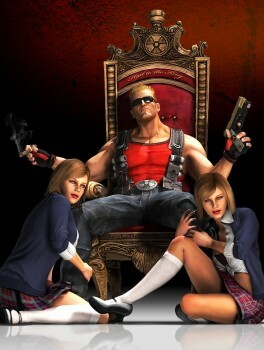 The Big Day isn't here yet, but the big day announcing the Big Day is: Duke Nukem Forever has an official release date. In 1997, Bill Clinton was inaugurated for his second term as the President of the United States. Princess Diana was killed in a car crash. Quake 2 was released to widespread acclaim. And a game development company called 3D Realms announced a sequel to the big 1996 hit Duke Nukem 3D entitled Duke Nukem Forever. Well, here we are, it's two-thousand-and-freakin'-eleven, and guess what? Finally, for real, no foolin' around, after more than a decade of dicking around, 2K Games and Gearbox have made it official: the Duke is back on May 3 in North America and May 6 in the rest of the world. "When I said goodbye to 3D Realms and the original Duke Nukem 3D team in 1997 and soon after founded Gearbox Software, I never in my wildest dreams imagined that a day like today would come," said Gearbox President Randy Pitchford. "Today I am proud, humbled and even astounded to announce that the day is coming at last for all gamers to be a part of video game history: Duke Nukem Forever will launch worldwide this May!" I think it's safe to say that a lot of gamers, who were in grade four when the no-longer-ironically-named DNF was announced and have since graduated from college, share Pitchford's astonishment that this is actually happening and that they will in fact play this game one day soon. It's almost a little disappointing in some respects. Who are we going to lob cheap and easy vaporware jokes at now that Duke Nukem Forever is an actual, real thing? A demo is on the way, first for members of the Duke Nukem Forever First Access Club (included with the purchase of the Borderlands Game of the Year Edition) and then to everyone else, but there's no word on when it will be available. In the meantime, there's a brand-new reveal trailer you can eyeball right here at The Escapist. So remember: May 3 (or May 6). PC, PlayStation 3 and Xbox 360. Duke Nukem Forever. Don't be late!